It's been a crazy week, partly because my ninety-one year mom came down with pneumonia and ended up in the hospital briefly. She is doing much better but boy was it a lesson in how quickly the elderly can lose their strength. I've been trying to visit her as much as I can, but it hasn't been easy while trying to push back the chaos of life! At the top of my list of people I would like to invite for dinner is Dr. Christiane Northrup, who dedicated the first half of her life to studying all that can go wrong with the body, and how to fix it, but is devoting her second half of life to illuminating what can go right. She spends her time these days teaching women how to flourish. 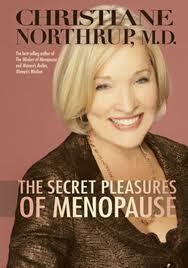 Dr. Northrup is the perfect example of how the pieces of our lives come together as we grow older. I like to read stories about how women's lives change course as they age. I guess it's really one of the things I love most about aging, that we all have this ability, especially in more recent generations. There is always the chance to reinvent ourselves, learn new things, and spread our wings, no matter how old we are. Older people who do this are very interesting to me. Anyway, I like her suggestions on the above video. I am doing well with her first two pointers but could use improvement on the third. I know that the first thing I do when I am stressed is not breath enough and it's when we need to breath more fully than ever. Another video I like of Dr. Northrup's is her clip on dealing with difficult people. Chic at Any Age you are the winner of the give-away! Please email me at louise@linesofbeauty.com and let me know what colors you like and also your mailing address. Congratulations! Interesting. When I taught Acupressure at the local massage school, I shared with my students the theory that what flowed along the meridians in the human body was nitrous oxide. Very interesting indeed Kass. I have to do more research about nitric oxide. At first I wondered if it is similar to what the dentist gives patients (laughing gas) but that is nitrous oxide and different. I think you mean nitric oxide? You're right. It's nitric oxide. Probably both considered laughing gas, especially the kind that is an ingredient in Viagra. Tee hee.